Peter Brewis succinctly addresses the feel of Open Here, Field Music’s sixth album proper. In Open Here, David and Peter Brewis – alongside a cast of many – have produced their most emotional record to date, touching on difficult circumstances in both the personal and political sphere, while maintaining a defiant stoicism that makes for a vital, enduring listen. A downer it certainly isn’t. Gorgeous instrumental accompaniment envelops the songs, particularly on the closing numbers Daylight Saving and Find A Way To, making it some of the most rich and ambitious work the band have produced. Share A Pillow has a Roxy Music-esque saxophone hook married to a coquettish guitar riff, while No King No Princess (a song eschewing the conditioning of gender roles) starts out sounding like something from Julian Cope’s Fried but then morphs into an incredibly effervescent and joyous song. What is remarkable about Open Here is the seamless interaction between the personal and political throughout the record. “I don’t think we’ve made a political record, really. We’ve made a record that conveys how we are feeling. But I think we’ve approached it with a sense of humour. I’m sure loads of bands have written about Brexit and Trump etcetera…Dave and I decided however we approached it we would do it in our way and in a way that married up to how we would approach music per se. 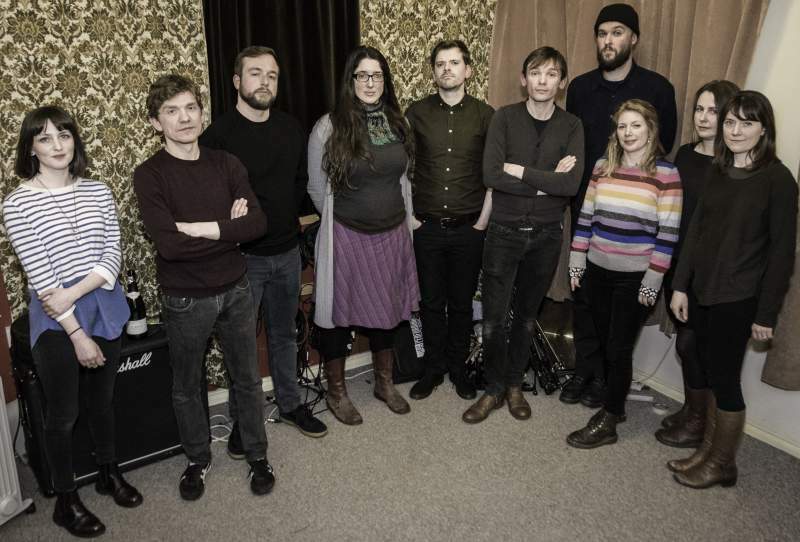 Field Music launch Open Here with three specially-staged performances at Northern Stage, Newcastle on Friday 2nd and Saturday 3rd February (including a matinee performance). These shows will be recorded and filmed, and will feature an expanded orchestral line-up with strings, brass, wind and percussion, all complimenting the gorgeous, textural nature of the record. For these shows, the core line-up of Peter and David, along with Kev Dosdale on guitar and synth, Andrew Lowther on bass and Liz Corney on keys and vocals, will be augmented by the team of players who performed on the band’s most recent albums. In that much of the record is a tribute to a very close friend of the band, the performances will be a fitting extension of that; an apt celebration of a profoundly emotional, satisfying piece of work. Thirteen years into producing albums of incredible consistency, Open Here may prove to be the band’s very best. Field Music & The Open Here Orchestra perform at Northern Stage, Newcastle on Friday 2nd and Saturday 3rd February. They also play The Georgian Theatre stage at Stockton Calling on Saturday 31st March. Open Here is released on 2nd February via Memphis Industries.